Walking the beach is so different this time of year. The hustle and bustle of summer is in the rear view, the air is lighter and humidity lifts to uncover a new, fresh, crystal clear blue waters and skies. The sun kisses the horizon at sunrise, the birds scatter through the rhythmical balanced surf snatching up crabs as they burrow deep into the sand. The sounds of summer are long gone, not even faint in the distance- it’s peaceful, wholesome. Walking along the shoreline, I catch a different sight- horses! Horses on the beach! They’re beautiful and compliment the beach so well. As I climb into the saddle, settle in, my horse’s mane catches the soft breeze and lifts slightly over the saddle. 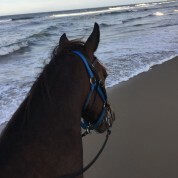 We walk down the beach, you can hear his breathing, you can feel his power and it reminds me of the ocean- strong, powerful, yet gentle and beautiful. Walking along the shore, the waves tickle his hooves and recede back into the water- it’s magical. The experience is amazing, it’s breathtaking yet so tranquil! The vibe is so real. The difference in seasons is dramatic, the change is stunning.